During the holidays, we all want to kick back and relax. Unfortunately, for workers like WAC member Gabriel, instead of resting with his family, he is having to fight against wage theft. Constantly having to call and visit his employer to get the wages he is owed has become like a second job for Gabriel. With little enforcement of our labour laws by the Ministry of Labour, the stress of making sure employers respect our rights rests squarely on our shoulders. In his 10 years as a painter, Gabriel gained a lot of experience in his trade as well as in dealing with bad bosses. Receiving payment for his work, on time and fully, is one thing Gabriel can never rely on. Every time he looks for work, employers claim they need to see “how well he paints” before agreeing on his wages. That might mean he’ll have to put in days, sometimes weeks of work without knowing what his wages will be. Still Gabriel continues painting because he needs to survive. He has found that the closer he is to finishing an assignment, the more difficult it gets to negotiate a fair rate of pay. Even when employers agree to a certain wage, they end up not paying fully. If Gabriel speaks up, he then gets punished for it. He has been fired at least four different times for asserting his rights. In 2015 when Gabriel wasn’t paid for his work, the Workers’ Action Centre intervened and the employer paid up. Earlier this year, yet another employer stole his wages. Adding insult to injury, the contractor threatened to call the police if Gabriel visited the job site again to ask for his pay cheque. Workers’ Action Centre helped Gabriel file a claim with the Ministry of Labour for more than $1200 in unpaid wages in April and we are still waiting for the money. Too many workers are experiencing wage theft, reprisals and lack of enforcement of labour laws. It is unacceptable how common these violations have become. 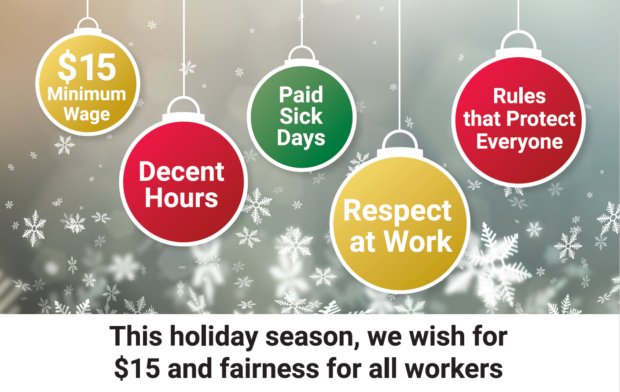 Join us at the December 3rd holiday action for $15 & Fairness at 1:00 pm by the south east corner of Yonge and Dundas. All workers, from construction sites to factories to farms, deserve decent work! Can’t make it on December 3 or not in Toronto? Take the Decent Work Sing-Along Challenge to show your support. Click here to watch WAC leaders singing “Joy to the workers”, and learn about how you too can participate.